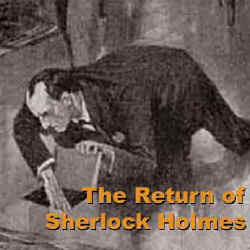 Audiobook - The Return of Sherlock Holmes by Sir Arthur Conan Doyle series of stories published in 1903, read by Patrick Horgan ~ 579 MB zip file. These adventures began to appear in Strand Magazine in 1903 and ran for a year. Since writing "The Hound of the Baskervilles" Conan Doyle was knighted for publishing a spirited defence of the English position in the Boer War, and had spent some time in South Africa as a Doctor in the Army. It turns out that Holmes did not die at Reichenbach Falls along with the villainous Moriarty. He has been around the world visiting religious centres and is now quite cured of his cocaine addiction. This collection has Doyle and his hero at the height of their powers. Popular wisdom has it that Sir Arthur killed off Holmes because he was sick of him and only resurrected him for money. The fact is that he was fond of practical jokes and this hoax has stood unchallenged for a century. He left all the evidence that Holmes would survive in the text of the "Memoirs". For a detailed presentation of this discovery read "The Detection of Sherlock Holmes" by Patrick Horgan.